Raja delivered the commencement address to about 550 undergraduate, graduate and doctoral students graduated Sunday during Waynesburg University’s 163rd Commencement ceremony in the field house. 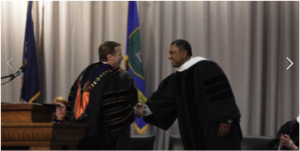 Click below to view YouTube Video and actual Commencement Script presented to 3000 attendees at the Commencement ceremony. Listen to the speech here! 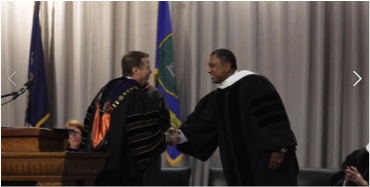 Listen to Raja’s conversation with Waynesburg President Douglas Lee here! It’s an honor for me to deliver the commencement speech today. So – you’re all wondering where you go from here and how your lives are going to turn out. Well, let me start by saying this: your best days are ahead of you! You’ve just completed a phenomenal education at this wonderful university. This is the foundation stone of your successful future. Since then the company has grown significantly and approaching 500 employees. We are headquartered in Pittsburgh with offices nationwide. How did that happen — and more importantly what did I learn along the way? Well — here I was — a 27 year old in charge of a growing company. My leadership style was simple: I knew it all and no one could do anything better than me at work. And I worked pretty much every day of the week including weekends. It took surviving two economic downturns — and twenty plus years — to realize that in order to be successful — my leadership style had to change. And today instead of working every day of the week – I work just two mornings a week. Because I learned how to build a great management team. Now my role is simply to enable my team to succeed and to grow as leaders. While my leadership style had to change — what allowed the change to be successful — was the consistency of my words and actions. I say actions because most leaders talk about integrity. However — it’s the actions of leaders that determine if they really have integrity. You know, walking the walk. And the leaders’ actions build their personal reputations and lead to the building of great companies. So it’s vital to remember that your actions are connected to your integrity and ultimately determine your reputation. For example: Are you patient or impatient? Are you dedicated at work or just punch the clock? Are you arrogant or humble? All of these things — make up your reputation. And at the end of the day — you will be judged by your reputation. Since you are starting on the work phase of your life, you are probably wondering what it takes to be successful at work. Let me share the secret of success at work. As you leave school now and take up a job, your first promotion is likely to be based upon your technical skills. Let me give you an example. If you start as an accountant, you get promoted to manager of the finance department because of your accounting skills. If you start in marketing, you get promoted to manager of that department because of your marketing skills. I call this line management. But your promotion higher up the chain — from line management to division management and onto the C-suite — depends not upon your technical skills but upon your leadership skills. Your success at this stage depends not on your technical skills but upon your leadership skills. Reputation is the basis of leadership, no matter the job. Reputation is the reflection of your character. Well, your character is only known to you. However, your reputation, which is the reflection of your character, is known to others through your words, actions and deeds. The secret of success at work is….. to build a great reputation. This is the same secret for success in life too. The secret of success in life is…… to build a great reputation. You focus on building a great reputation and success is guaranteed to follow. From a practical perspective, how can you build a good reputation? You can start by emulating those you admire. For example, at work you can emulate the leaders in your company. Evaluate the reputation of these leaders – do they work hard, do they make logical decisions, do they treat their employees fairly. If you build your reputation with these same characteristics, you are assured to get promoted all the way to the corner office. Reputation is built over many years, one word at a time, one action at a time, one deed at time. In leadership, few things matter more. Reputation is one of the most treasured and powerful assets. It is what others think of us, and it’s at the foundation of how we distinguish ourselves. Reputation is built during good times and bad times — and more so during bad times. Let me share with you what I consider a key approach to managing your reputation. A young woman went to her mother and told her about her life and how things were so hard for her. It seemed as one problem was solved, a new one arose. In about twenty minutes she turned off the burners. She fished the carrots out and placed them in a plate. She pulled the eggs out and placed them in a bowl. Then she poured out the coffee into a cup. Turning to her daughter, she asked, “Tell me what you see. The daughter was puzzled and replied “Carrots, eggs, and coffee, Mom”. Her mother brought her closer and asked her to feel the carrots. She did and noted that they were soft. The mother then asked the daughter to take an egg and break it. After pulling off the shell, she observed the hard-boiled egg. Finally, the mother asked the daughter to sip the coffee. The daughter smiled as she tasted its rich aroma. The daughter then asked, “What does it mean, mother?” Her mother explained that each of these objects had faced the same adversity — boiling water. Each reacted differently. Are you the carrot that seems strong, but with pain and adversity, do you wilt and become soft and lose your strength. Are you the egg that starts with a malleable heart, but after a breakup, a financial hardship or some other trial, have you become hardened and stiff? Does your shell look the same, but on the inside are you bitter with a hardened heart? Or are you like the coffee bean? The bean actually changes the hot water, the very circumstance that brings the pain. When the water gets hot, it releases the fragrance and flavor. If you are like the bean, when things are at their worst, you make the best of the situation and change the environment around you. Keep this story in mind particularly during bad times.` Ask yourself “are you a carrot, an egg or a coffee bean?” and remember to strive to be like the coffee bean! Let me now share with you a personal decision I made early on that got me in real hot water. I was born in a city called Bangalore in South India. My dad did not get to go to college and my mom did not get to go to high school. My dad’s parents died when he was young and he did not have the money to go to college. So he got a job at a local university. Working in the university environment — he always regretted not completing his education. As a result — he put high emphasis on education for me and my siblings. After I completed my undergraduate degree from the top University in Chennai – India – I got into Virginia Tech. I took a loan from India to come to the US for graduate school. The maximum loan I could get would only cover the first trimester and my hope was that I would get a scholarship thereafter. My undergraduate degree was in Electrical Engineering and I had gotten admission into the Master’s program in Electrical Engineering. The course work in the US was much different from India. After I was exposed to the courses — I clearly saw that my passion was in Computer Science and not Electrical Engineering. If I was to pursue a Masters in Computer Science then I needed to change majors and take undergraduate courses in Computer Science first. This was a really difficult choice for me since I knew that I would be risking not getting a scholarship by changing majors. But I followed my passion – and made the change to Computer Science. While this turned out to be a really good decision in the long run, it got me in hot water. Listen, I would make the same decision even today. Whenever you are faced with a difficult choice, follow the option where your passion is. This will ensure success in the long term. Short term could be a different story like with me. My loan money ran out at the end of the first trimester — and a scholarship was of question for the second trimester. So — I decided to look for campus jobs. I applied job after job and given my even stronger accent then and lack of experience — I was turned down every time. While I felt discouraged — I was not bitter. I was upbeat and continued to look for a job with enthusiasm. And I was rewarded with a dream job! The job was mundane, tedious and lonely. But I did my job so cheerfully, I kept smiling, I was friendly, I was caring — so much so — that the woman who ran the lab became one of my best references later. I still didn’t have enough money to pay both the school fees and lodging. I contacted everyone I knew in the US. I was fortunate to have one of them be kind enough to lend me money to cover through the third trimester. Now the bad news – I learned that I did not get a scholarship for the next year. Next comes the summer session. Since I had no money for coursework, I started to look for a full-time job on campus. I got a job teaching tennis to kids at camp at Virginia Tech for the summer. It provided free meals and lodging. I turned my focus to applying to other schools in the US hoping that I’d get a scholarship. Not knowing how I was going to finish my education was stressful. But I did not let this impact my attitude. I made great friends and learned a lot about the American way of life. Finally — I got my first break which brought me to Pittsburgh. University of Pittsburgh granted me admission and full scholarship in their Computer Science program. And from then on — it was sort of easy going with school. While Virginia Tech was one of the most stressful years of my life, I still have fond memories — I just try to forget the cockroaches. And, not to forget, this got me to be a pretty good tennis player which was quite handy in impressing my wife when we were still dating. It made me realize that everyone gets into hot water at times — but the one thing you can control is the way your react. While you may not be able to control the situation – the one thing that is always in your control is your reaction. This includes your emotions and your actions. And if the way you react is the way the coffee bean flavors the hot water — you are going to come out better and stronger. In fact, the older I get, the more convinced I am that success in life is not so much what happens to us — as it is how we respond to what happens to us. We have the power to choose our response to situations that happen to us. Watch your thoughts. They become your words. Watch your words. They become your deeds. Watch your deeds. They become your habits. Watch your habits. They become your reputation. I want to take a minute to thank Waynesburg University. It is an honor to be associated with this great institution – and for to receive this doctorate. This honorary doctorate completes a great circle in my life. It means the happy closure to my father’s dream – who never had the chance to go to college. And it means the closure of my mothers dream. The dream of an wonderful woman who never got to go to high school. Their dreams for me have been fulfilled today – as their son – now half a world away is bestowed this honorary doctorate. One thing I know for certain – all of you out there who have worked so hard to get your degree – as proud as you are now —— your parents are so much prouder. In closing – remember the best days of your life are ahead of you – and you are in control of your life and your success. God bless all of you. Thank you! 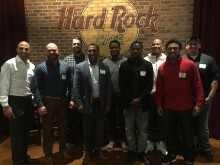 Raja delivers keynote in “Here’s My Story XV” in conjunction with select group of Steelers including Coach Tomlin, Will Allen, Landry Jones, Ryan Shazier, Markus Weaton and others to a packed audience at Hard Rock Café. Raja, Host of The Raja Show, will be emceeing our event, bringing a unique energy to the event’s atmosphere. 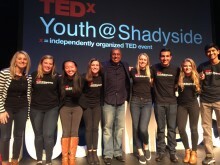 The impressive speaker lineup included eleven individuals of various backgrounds and professions speaking on diverse topics within technology, healthcare, business, and the arts.